T. C. Rogers was born, raised, and educated in Butler County. He brings new knowledge and insights as a business owner of over 35 years and supporter of local office holders for more than 25 years. Having lived in six different Butler County communities affords him the benefit of long-lasting relationships with outstanding people throughout the county. As a graduate of the University of Cincinnati, he is acutely aware of the importance of providing exceptional education to our children. His primary goal is to provide a safe, vibrant economy that these same young men and women will choose to continue their lives in Butler County after graduation. As Commissioner, T.C. 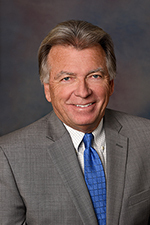 serves as President of the OKI Regional Council of Governments, and as a board member of the Port Authority, Board of Revision, Zoning Board of Appeals, Rural Zoning Board, Metropolitan Housing Authority, Investment Advisory Committee, Planning Commission Residential Board of Appeals, County Commissioners Association of Ohio, and the Land Reutilization Bank Committee.